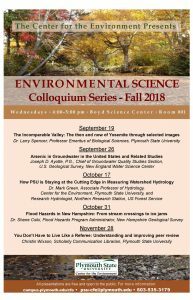 The Center for the Environment announces the Fall 2018 Environmental Science Colloquium series. Each term, we organize a series of talks on Wednesday afternoons, 4-5 pm. The talks cover a wide range of topics. They are open to everyone from PSU and the community. The talks are in Boyd Science Center, Room 001. Please enter Boyd at the entrance closest to Highland Street. Boyd 001 is the lecture hall by the foyer.